These are coffee meringues. I don't drink coffee, but love the smell and taste of coffee-flavored foods. Honestly, I didn't care for these, but I think that's because I am not usually a fan of meringues. 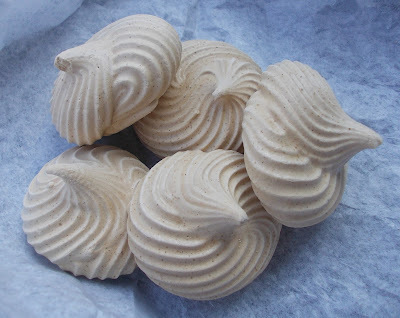 If you haven't tasted meringues, imagine a super-light cookie; now pump it full of air. Then pump in some more air. I like something I can really sink my teeth into. There are just three ingredients here: egg whites, sugar and, as the woman behind the counter explained, coffee that's added at the last moment when the meringue gets to a nice, thick consistency. BTW, I love how this photo turned out. With the late-morning lighting in my car, the blue background was the result of setting these on a plain white wrapper that my pain au chocolat had been served up in.... Serendipity!